TOPEKA — A reminder that we’re not walking on this earth alone. That’s how Father John Torrez, pastor of St. Matthew Parish in southeast Topeka, tends to think about the Stations of the Cross. Growing up, Father Torrez said reflecting on the Stations was one of his favorite devotions. Now, as pastor of a parish of 1,100 families, he’s especially gratified to see the enthusiasm the parishioners have for the devotion. 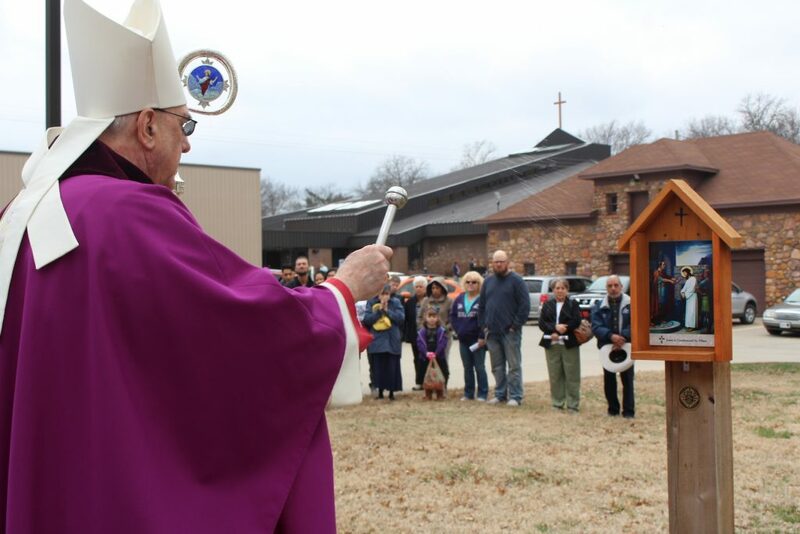 When he was approached by parishioners who wanted to erect an outdoor Stations of the Cross on the parish grounds, Father Torrez said it was easy to give his approval for the project. Located just slightly northeast of the church building, the outdoor Stations’ area was a joint effort of the parish’s Knights of Columbus Council 13012 and the parish grade school’s Faith in Action class. Planning for the area began more than a year ago, when Bob Broxterman, the parish administrator, and Tim O’Shea, a member of the Knights, were inspired after seeing something similar at another Catholic church. On March 24, Archbishop Joseph F. Naumann visited the parish and blessed the Stations after the 10:30 a.m. Mass. Calling this practice of meditating on the Way of the Cross “an inexpensive way to visit the Holy Land,” the archbishop noted the outdoor setting was appropriate, given that Jesus carried his cross outside the city gates to Calvary. The Stations themselves were purchased from Catholictothemax.com by the Knights of Columbus who held a breakfast fundraiser that brought in more than $1,300. According to Grand Knight Mike Barnard, the Knights raised more money than anticipated originally and, as a result, were able to buy a nicer set of Stations. Almost everything else — like posts, mulch and labor — were donated by companies such as Westar Energy, or by the parishioners themselves. A group of nearly 75 parishioners installed them this past September. For Deb O’Shea, instructor of the Faith in Action class, the idea of passing the beauty of Christ’s sacrifice on to future generations is what the project is all about. On the second Friday in Lent, she witnessed the eighth-graders making the Stations with their Bible buddies, the second-graders. She said it was encouraging and inspiring to watch the eighth-graders and hear their witness and explanations to the younger students. For Father Torrez, it’s yet another symbolic reminder of Christ’s love for his people and the power of Our Lord’s sacrifice.